Long ago we decided our beds should be beautiful and built to last, just like our heritage. After much work you can enjoy the end product - this four poster bed. A bed this beautiful deserves to be appreciated in your bedroom. Revel in the beautiful paneled wood and you may even notice how the grain of the wood of the center panels are angled diagonally while framed in vertical and horizontal grains. This combination of grain orientations is aesthetically pleasing. Perhaps it will hark back to a simpler, more colonial, time and you may just fall into a peaceful slumber for it is a bed after all. 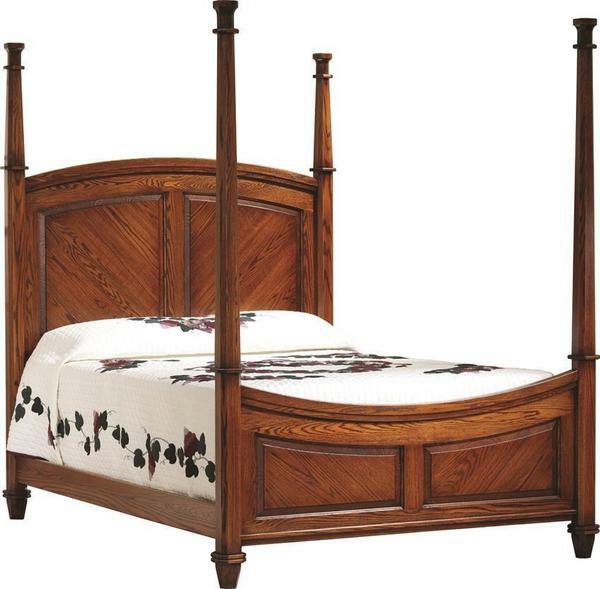 This bed was designed and handcrafted by the Amish right here in the United States. The Amish are known for building products that last and this bed is no exception. Our beds are built to provide rest for many generations. Valerie: Leon successfully delivered our bed this AM as scheduled. He was there at 7:30AM and had it assembled by 8am. It is beautiful craftsmanship and is every bit as beautiful as my wife and I had hoped for. I was leery about buying this type of furniture online but you can now count me as “a satisfied customer”. Thank you Valerie!